Elton John's husband David Funish buys a London flat for male dancer pal. ELTON John’s husband David Furnish enjoyed an extraordinary friendship with a male dancer who now lives in a flat which he bought. Film producer Furnish, 52, met Danny Williams, 33, on a club night and they were seen out together for 18 months. They partied at the posh London home Furnish shares with Sir Elton. And on Furnish’s 51st birthday, Danny flew first-class from London to Hawaii to celebrate with his pal. Land Registry documents from April 2013 show Furnish paid more than £330,000 for a two-bed flat on a run-down road in South London. He organised the interior design and furnishings in 2012, knowing Danny would move in. Assistants at firms run by Furnish and Sir Elton even ordered the pots and pans for the pad. Describing the relationship, a source said: “Furnish and Danny were close and went out a lot on the gay scene. “Elton would not be there as he does not like clubbing and was often away touring and working. “Furnish and Danny had a great time on holidays as well as in London. Danny is extremely handsome and muscular and gets a lot of attention from blokes on nights out. “He ended up in a lovely flat which David sorted for him, as well as having some great trips abroad. “I don’t think that someone who works as a trainer in a gym would normally fly to Hawaii first-class.” Pals insist the flat is all above board and Danny pays rent. 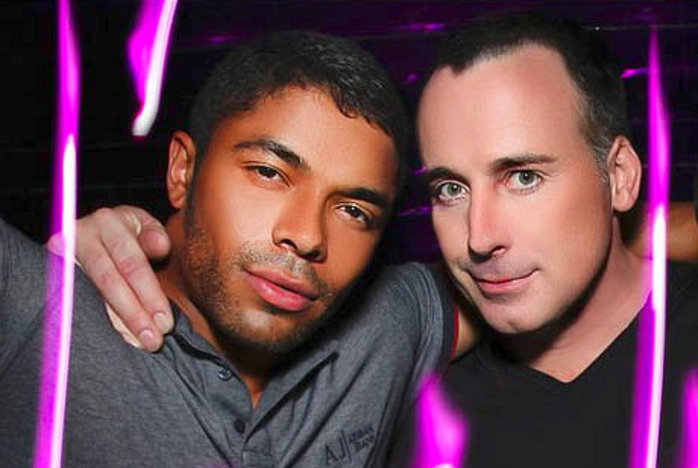 The Leeds-born dancer is openly gay according to his open Facebook profile. He has a son, 12, and daughter, ten, from a relationship with a woman. He works as a personal trainer at a London gym and has appeared in magazines including Attitude. Our source said one of the first times Danny and Furnish were spotted together was at Club Room Service in Soho in April 2012. A picture from the club night’s Facebook page shows Furnish with his arm around Danny, and Danny’s twin brother. Two months later Danny posted a picture of him and Furnish, with their arms around each other, on his Facebook page. The following month, in July 2012, Danny, Furnish and pals went to the Greek island of Mykonos. Sir Elton was on his Greatest Hits tour. On their trip, Furnish, Danny and Danny’s brother were pictured with pals on the yacht Hercules. Danny is seen with his arm around Furnish, who in turn, has his arm around Danny’s waist. Sir Elton, Furnish and sons Zachary, four and Elijah, two — who have the same surrogate mum — were pictured on the yacht last summer near St Tropez, France. They have an open relationship, just like George Michael did with his husband. Gays fought for the right to be married like heterosexuals, but still screwing everything. But if you don't agree with their lifestyle, you're a homophobe.